Trust Peak Pressure Washing for all of your residential low pressure washing needs in Holly Springs NC. Your home’s exterior can become dull and grimy over time from dirt, pollen, mold, mildew, and other substances. Low home pressure washing from Peak Pressure Washing in Holly Springs is the sure way to return your home to its clean state. We begin by applying a soap mixture that will cut away even the toughest dirt and grime but gentle enough not to damage your homes siding, wood, or other building material. A low pressure washing is then used to clean your home’s exterior leaving a renewed and fresh appearance. No matter your residential low pressure washing needs in Holly Springs NC, Peak Pressure Washing is at your service! Exposure to the elements will stain your roof over time. Dead leaves and plant matter, pollen, and other outdoor substances can ruin the appearance of your roof. 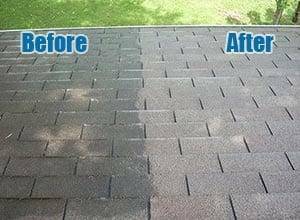 Peak Pressure Washing in Holly Springs, NC provides residential low pressure roof stain removal, cleaning, & washing to restore your roof’s appearance by removing muck and stains without damaging shingles or tiles. 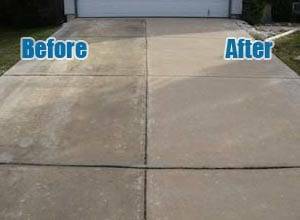 Driveways, walkways, patios, and other concrete areas surrounding your residence can become stained and damaged by rust, grease, oil, and plant matter. Peak Pressure Washing offers residential concrete, masonry power washing in Holly Springs NC to return your home to its original beauty. No matter your concrete power washing needs in Holly Springs NC, trust Peak Pressure Washing. When your home deck needs cleaning as a result of weathering, dirt, pollen, mold, or other substances, trust Peak Pressure Washing in Holly Springs to do the job. 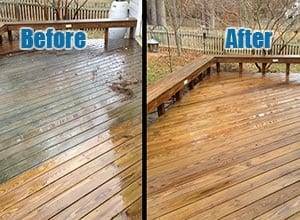 Our low pressure deck washing & soft wash deck cleaning services in Holly Springs, NC will leave your deck clean without damage to wood and other surfaces. Your home’s gutters in Holly Springs can easily become clogged with leaves, dirt, and other debris. 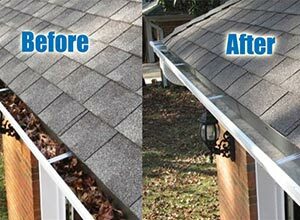 Even gutters with guard covers still require cleaning as staining and weathering occur externally. 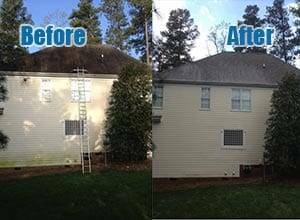 Pressure wash gutter cleaning & low pressure gutter face washing from Peak Pressure Washing in Holly Springs, NC will unclog & clean your gutters giving your home a pristine appearance. When you require superior pressure washing services and power washing services for your commercial property or business in Holly Springs NC, look no further than Peak Pressure Washing. We realize the outside of your business provides customer’s first impressions, so we make it our business to keep yours externally clean and inviting. Our commercial power washing & commercial pressure washing services include commercial low pressure power washing for your business’s exterior, commercial low pressure roof washing & commercial low pressure awning & signage washing, commercial concrete pressure washing, and commercial pressure wash gutter cleaning & gutter face washing. 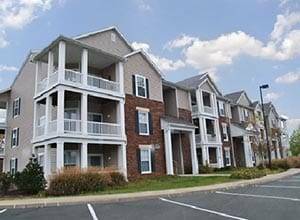 We specialize in HOA and condominium or apartment complexes, service & gas stations, & office parks. Contact Peak Pressure Washing in Holly Springs, NC to receive the superior pressure washing your business deserves. Peak Pressure Washing is your source for commercial & residential low pressure power washing services. We proudly offer our pressure washing & power washing services in Holly Springs, Raleigh, Cary, Apex, Fuquay Varina, Clayton, Durham, Garner, Morrisville, Knightdale, & beyond.